1. 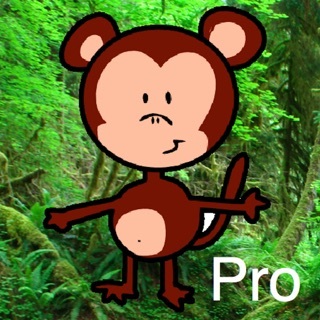 Use drawing tools and/or import photos to make a background. 2. 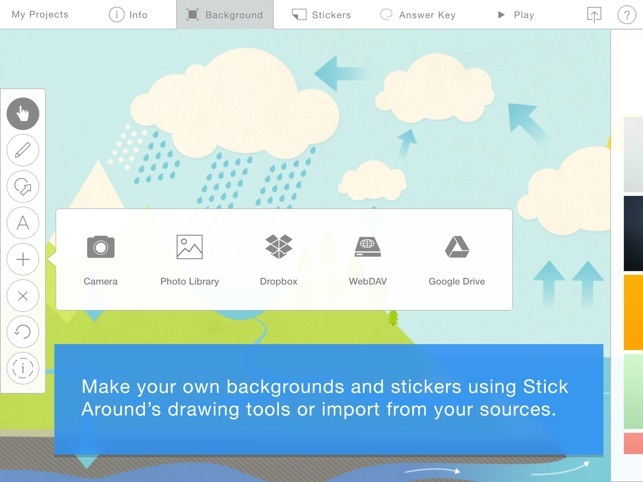 Add stickers with text, images, and/or drawings. 3. 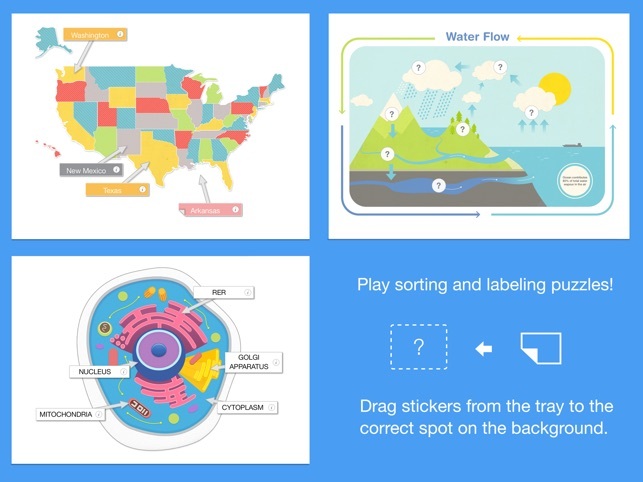 Indicate where stickers belong by making an answer key. Teachers can make puzzles for their students to practice content. Students can program their own study aids. Parents can design customized puzzles for their children. 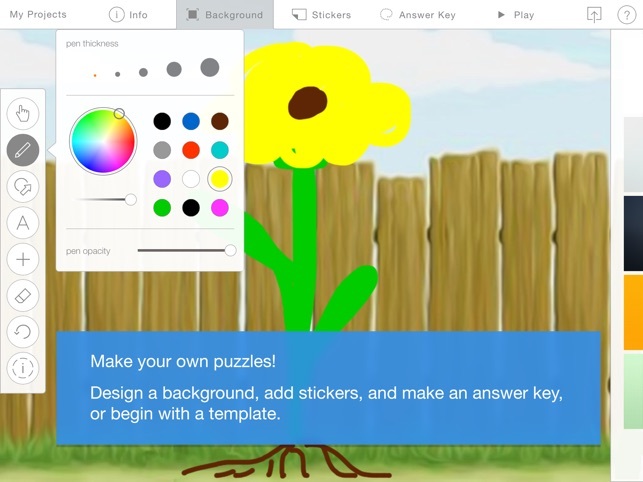 There are loads of possible uses for Stick Around for any age level, from toddler to college! 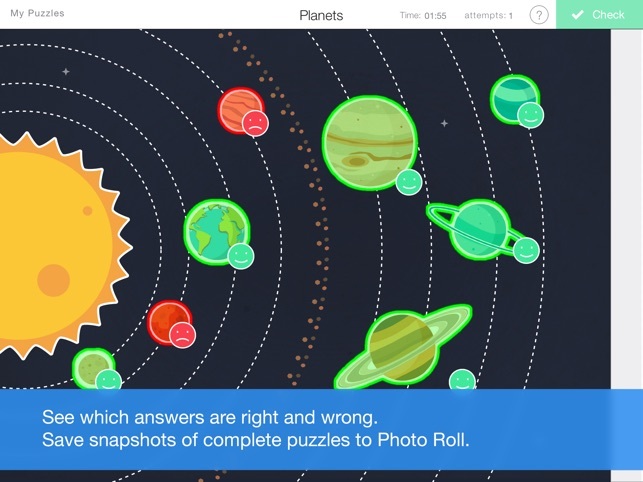 Follow Stick Around to download new puzzles that can help make learning stick! Have a puzzle you'd like to share? Use the hashtag #stickaroundapp! You can share puzzles with others via email, AirDrop, Dropbox, GDrive, WebDAV, and "Open in..."
Please note: The receiving iPad must have Stick Around installed in order to play. 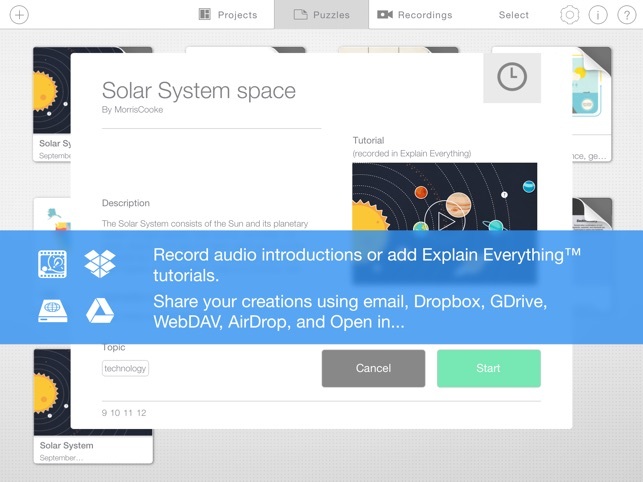 MUST have app for EDU toolbox-VERY Impressed with 1st version! I go through apps like popcorn, but this one's going to be one that “sticks” (pun intended)! Stick Around fits a need I’ve been looking for a long time-EASY, custom built skill practice. 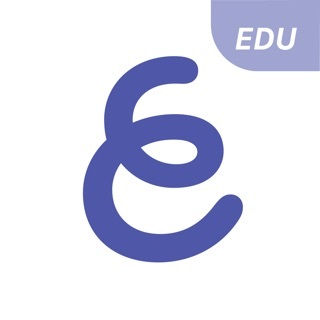 It’s a year round app for all levels and subject areas. It also applies many elements of Universal Design for the Learner (UDL)-multi-modalities, feedback and customization. It’s rare to get an app that can be both a skill practice and CREATIVITY app depending on who is building the activities. Bravo from the creators of Explain Everything and Tony Vincent. Now let’s get that activity share community going for the app! 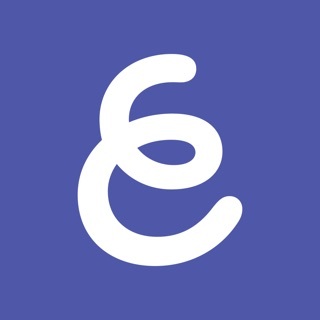 This app combines the best elements of creation and innovation. It is a brilliant concept and the best use of app smashing that I have seen so far in the apps store. The integration of several cloud platforms is another area where this app rise above others. The way it allows resources to be brought together from several platforms into one place is another bonus because it maximizes the options for content creation. This is their first version, so I imagine it is only going to get better over time. I look forward to seeing where Tony Vincent's imagination take us. I have been the Technology Integration Specialist at my elementary school for a year and have been wanting an app like this the entire time! It has the functionality of a Smart Board- the ability to drag images around with the added bonus of a check your answers template. I have only done a few lessons with it so far, but it will for sure be an app I use regularly! Highly recommend. The video tutorials available helped me figure out how to use the different features when I wasn't able to on my own! © 2013-2016 Explain Everything and Tony Vincent Inc.